What is it that you long for? Dream about? Hunger after? We all desire more than just the endurance of our daily routines. But often we feel limited and stuck - like we're merely existing instead of living. That's not the way it was meant to be. God intends the humanity in each of us to be deeply experienced, lavishly enjoyed, and exuberantly celebrated. In fact this is what the gospel is all about. Yes, the gospel. Contrary to conventional thinking - inside and outside the church - following Jesus is not about denying our humanness but embracing it. Rather than acting more spiritual or being more religious, we're called and enabled to become more fully human...and alive. 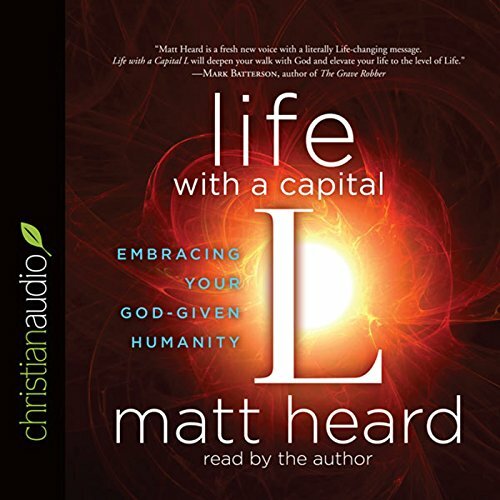 Matt Heard escorts us on a journey of discovery: that Jesus didn't come to save us from our humanity - Christ instead yearns to restore it to what God originally intended. Matt then explores 10 key areas where everyday life can become extraordinary Life. Christ promised we could "live life to the full". He didn't just mean eventually. Life with a Capital L is the Life you are longing for. Now. Inspiring and Empowering to Live Live with Such Intentionality ! Thank you Matt for illustrating the Kingdom perspective that can transform each moment of a fallen world existence. Alive in Christ! Abide in Christ! Thrive in Christ! Move this to the top of your list. Outside of the books of the Bible, this is one of the best. The audio version is fantastic, especially since it's read by the author, and you can tell his emotions. Some parts got me bogged down but then he ties together and ends each chapter with an astounding last paragraph or sentence, that you have to pause and think and try and parlay into the way you live. This would be a fantastic book or audio book for those who have gotten tired or fed up or turned off by the church. if you could get that person to listen to or read it. the book was well-written, I loved it, it was inspiring and motivational. It helped me see that the human side of humanity is to be embraced not rejected. this is a good reminder of why God put us here and how we should embrace life, with all our struggles and triumphs. That there is life everywhere! Matt's narration is from the heart - when he tells you about his own personal experiences, you can hear his deep emotion in his voice. Very moving! The truths in this book are rarely discussed in Christian circles - that it is acceptable, in fact, expected, that we live life here on earth savoring and enjoying what God has created. No need to delay the enjoyment of the New Life we have received until "Heaven." I say "Amen" to that!